Our policy is 100% customer satisfaction. We will always supply you with spare parts or replacement parts at reasonable cost and without hassle. Simply email us and we will find out how we can help you. At least we want you as a happy customer! Periodically we will release upgrades or useful accessories for our products. Once in a while it’s worth to check back with our online store to find out what’s new. Blackeye™ warrants all products to be free from defects in parts and workmanship for the legally required period from date of original purchase. BLACKEYE™ will repair, or at its option, replace a defective unit or any components thereof free of charge. This warranty is in lieu of all other warranties and conditions, expressed or implied. 1. Damage caused by improper handling and operation of the product or lack of knowledge of functionality of the product. 2. Damage caused by irregular exposure of the unit to water, heat, snow and extreme humid environments. 3. Battery exhaustion and battery leakage. 4. Damage to or failure of the unit or any component due to alteration, misuse, battery leakage or lack of maintenance. 5. Scratches or cosmetic damages. BLACKEYE™ disclaims any responsibility for incidental or consequential damages. 6. Units which have been opened or serviced by unauthorized personnel. Please note: BLACKEYE™ is not responsible for any loss or any damage to a third-party device or equipment (e.g. cameras, helmets, sports gear, etc.) 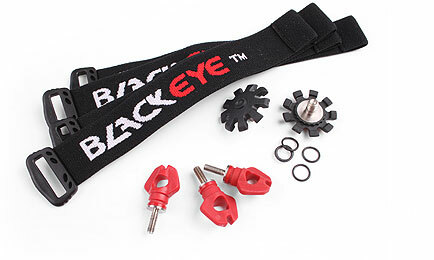 which is used in connection with the BLACKEYE™ product for filming or similar activities. In Canada and the United States this warranty gives you specific legal rights, and you may have other rights which may vary from state to state and from province to province. Where any term of this warranty is prohibited by the law of any jurisdiction, such term shall therefore be null and void, but the remainder of this warranty shall remain in full force and effect. 1. If you need warranty service, please contact the point-of-purchase location (distributor/dealer) for their customer assistance regarding replacement or repair. If point-of purchase warranty has expired and your product is still under the manufacturer’s warranty, contact the BLACKEYE™ Customer Service via email (contact@blackeyeusa.com). 2. Please ask the BLACKEYE™ Customer Service for an RGA (Return Goods Authorization) number. An RGA number is required for each warranty return shipment. 3. In your shipment, include a copy of the original receipt or invoice showing proof of date of purchase. Also, clearly print and include your return address information for return delivery. 4. Ship your warranty return (postage and shipping prepaid) to the address which you will receive together with your RGA number. Mark your Return Authorization Number clearly on the outside of the package. Warranty returns without Return Authorization Number or without prepaid postage or shipping will be refused. For your protection and to expedite handling and postal claims we recommend that all returns be insured and sent via Certified Mail, Return Receipt Requested, or via UPS®, Fedex®, or other reputable carrier.